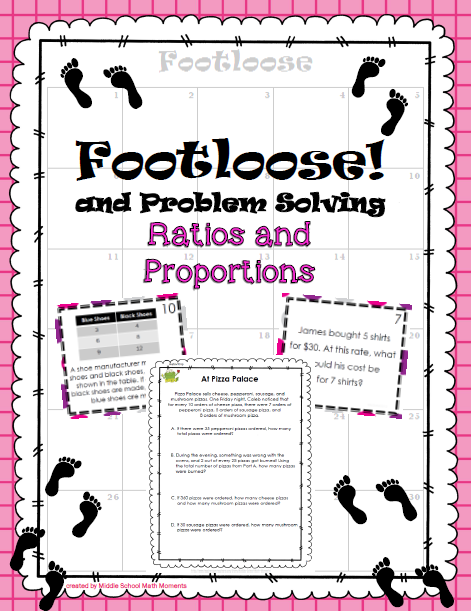 The Best of Teacher Entrepreneurs II: Math Lesson - "Ratios and Proportions Footloose and Problem Solving"
Math Lesson - "Ratios and Proportions Footloose and Problem Solving"
Students (and teachers) love Footloose! It's a great way to review concepts AND keep students moving and engaged at the same time. Ratios Footloose and Problem Solving includes 30 cards that require students to identify ratios of items, write equivalent ratios, solve proportions, and find unit rates. Students solve every problem and record their answers in the corresponding box on their Footloose grids. This activity includes the Footloose grid, 30 cards (a set with polka dot background and a set without background - SAME set, just the option of a background for you when you print them), an answer key, and directions. Also included are five problem solving pages, each with a problem solving "situation." Each page has 3- 4 questions to answer about that situation. These problems incorporate ratios, proportions and unit rates. These problem solving sheets can be used for individual work or cooperative group work. Students record answers on the answer sheets provided; answer keys are included and are very detailed so that students can self-check if you wish.